At $25 and $35 is Raspberry Pi is currently the cheapest board you can buy to develop for ARM Linux, however the expansion boards such as the Gertboard ($60) and the recent PiFace Digital ($32) are not as cheap considering the few components they have on board. This is why Olimex has designed a Raspberry Pi GPIO to breadboard & UEXT adapter (RPI-UEXT) which should be available in 2 weeks for 3.95 Euros (~$5). You then just need to add a breadboard for 2.95 Euros (~$3.8 ), which means for just $9 you can start prototyping easily with the Raspberry Pi. The RPI-UEXT adapter (PCB Layout pictures on the right) also features – as the name implies – a UEXT (Universal EXTension) connector which consists of 10 pins which provide power (+3.3V/GND), and access to asynchronous serial I/O, I2C & SPI signals. 2x MOD-IO boards with relays, GPIO and analog inputs. MOD-RTC module that sells for just 4.95 Euros, so that you can easily add an RTC clock for about 9 Euros ($11.50) to the Raspberry Pi. 4 different LCD modules starting with a 1 row 9 character LCD to a 4.3″ LCD display. A Wii Nunchuck joystick with 2 buttons, a 3-axis accelerometer and XY joystick. 3 sensor modules – Accelerometer, magnetometer and temperature probe. 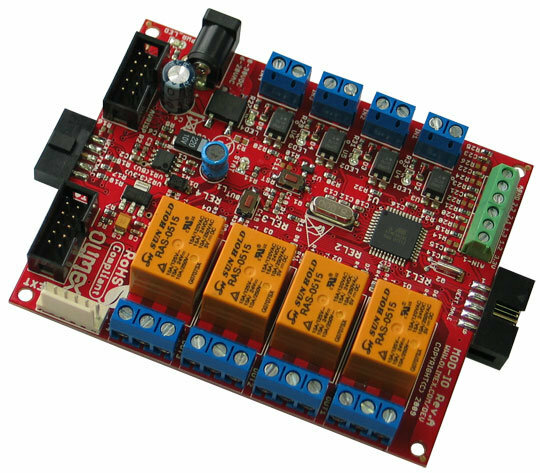 One RS485 convertor module to control motor and/or other instruments. 2 “health/medical” modules for measure heartbeat and blood oxygen levels. Other UEXT modules are also being developed such as an RGB LED controller, a 110/220VAC dimmer controller and an energy metering module. You can find more information about individual UEXT modules, including pictures, on Olimex post about RPI-UEXT adapter.